To go with the theme of my obsession with Sweden and not mentioning Fredrik in my posts, I thought this would be approrpiate. 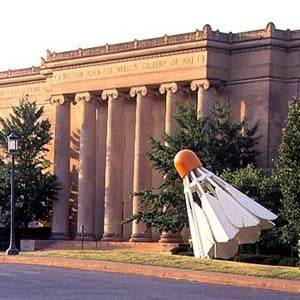 Today my friend Dom and I went to the Nelson Atkins art museum in the plaza district, and there is a new exhibit featuring their famous shuttlecocks, to which I found out were designed by a SWEDISH sculptor, by the name of Claes Oldenburg. I remember going to the Nelson in high school and basically feeling at home at this museum. It's one of my favorite places to go, and today was no different. The new additions to the museum are amazing, and there is so much artwork. Dom and I walked around for nearly 3 hours and I definitely could have stayed longer...but we got hungry! And I definitely enjoyed our happy hour wine and happy hour hor d'ourves! Joe and I are going to take the boys to the Nelson this fall- I can't wait. They love paintings, but they think Joe did every one they see.